Mattress pads are a common addition to any mattress and are a great way to add a layer of comfort to an otherwise uncomfortable (or older) mattress. They are relatively inexpensive and can be a great short term solution for a better night’s rest. Want to just see the full list of mattress pads? Click here to slide down to the bottom of the summary. A mattress pad is a relatively thick piece of quilted material that sits on top of your mattress, but below your sheets. It is primarily used to add comfort, but some also can help protect your mattress from general wear and tear and provide an extra layer of defense against, spills, soils and stains. Adding a mattress pad can slightly change the feel and firmness of your bed. If you find that you are happy with the current feel of your mattress, adding a mattress pad is really an unnecessary expense. Mattress protectors, mattress pads and mattress toppers are all different a-la-carte options you can add to an existing mattress. While they sound extremely similar, there are a few key differences to note before you start the search. You may find that not all of these are necessary in your situation, which can save you hundreds of dollars in “bonus bedding”. Mattress protectors are thin and usually waterproof- designed to sit directly on the surface of your mattress like a fitted sheet. Generally constructed from cotton or polyester, they are added below the fitted sheet and are the last hope to protect your mattress from unwanted stains. The main mission is to repel liquids and keep your mattress in like-new condition. No matter if your mattress is old or new, I would highly recommend a mattress protector on every single bed. In addition to protecting from liquid stains, a good waterproof mattress protector will also protect against dust mites, bed bugs, pet dander or other allergens that may be floating around in the bedroom. See our full list of mattress protector reviews here. In comparison to mattress protectors, mattress toppers couldn’t be any more different. While a protector aims to protect, a topper aims to add comfort. 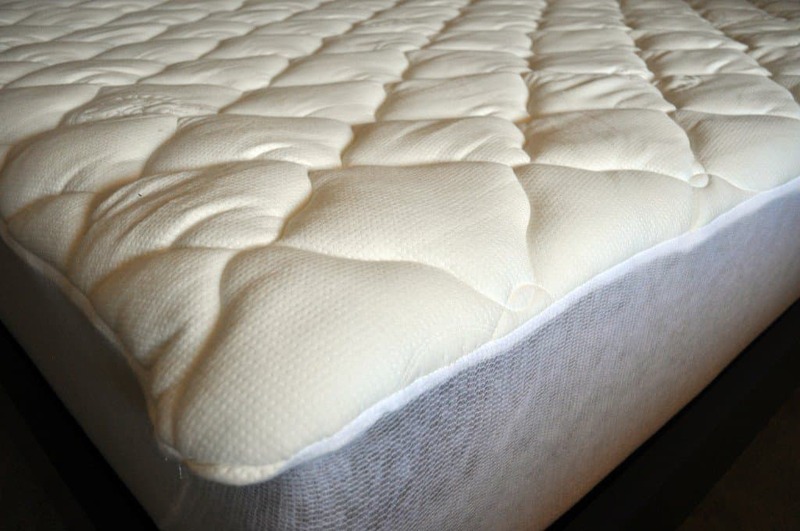 A mattress topper can be made of memory foam, latex foam, quilted blends or many other materials. It is typically added atop a mattress that is no longer comfortable. A thin mattress topper, 1-2” can slightly adjust the overall feel of your mattress (ex. eLuxurySupply memory foam topper) or a thicker topper, 3-4” can provide a complete overhaul! For more information on mattress toppers, be sure to check out our full list of mattress topper reviews. Mattress pads act as somewhat of a hybrid between mattress protectors and mattress toppers. They can provide protection from liquid spills and allergens as well as add an extra layer of comfort to your existing mattress. The thick quilted construction can provide a small amount of pressure relief that your current mattress may be lacking in. 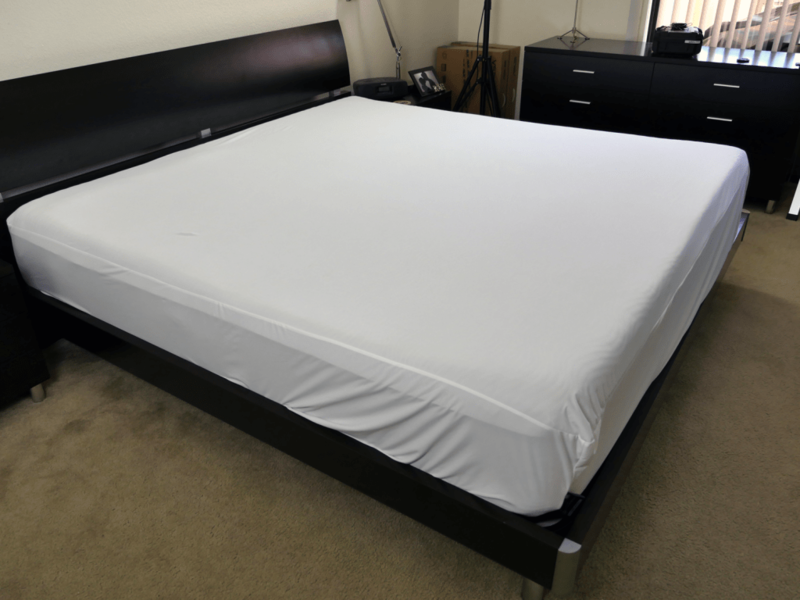 FAQ: Do I need a mattress pad or a mattress protector? In the world of mattress pads, there are two main styles, fitted mattress pads and anchor mattress pads. Fitted mattress pads are thick and fit just like a fitted sheet would. The quilted top provides extra stability and the elastic side panels stretch over the sides of the mattress to hold it firmly in place. Anchor mattress pads have a similar top to the fitted mattress pads, but the sides are treated a little different. In this installation, there are no side panels, but rather the top is secured to the mattress with a thick elastic band at the corners. 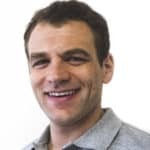 While this is generally less secure, if you are a light sleeper and not notorious for kicking your bedding off of the bed, an anchor mattress pad may work just fine for you. 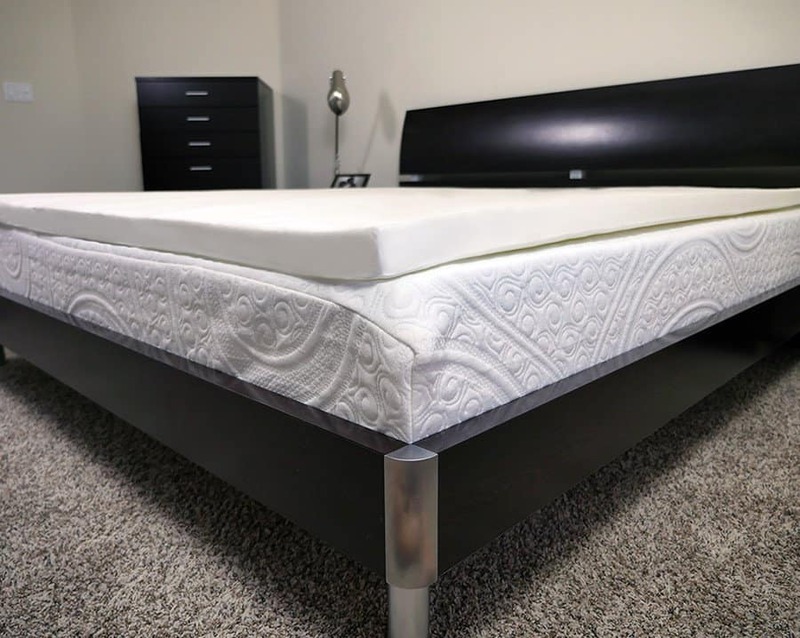 In addition to style, there is a variety of materials that a mattress pad can be made out of and each material will result in a mattress pad that’s distinctively different. Cotton mattress pads are the most common. They are typically thinner than the other styles as well as being machine washable. This feature alone may be a life saver for the stain-prone sleepers! A natural latex mattress pad is made from natural rubber and is extremely durable. Depending on the thickness and type of latex, these mattress pads can be used to soften a firm mattress or firm up an overly soft one. A latex mattress pad is also mold and mildew resistant which make it a great choice for the eco-friendly, hypo-allergenic sleeper. Check out our full list of latex mattress topper reviews here. Wool mattress pads may work well for sleepers who are looking for a durable mattress pad that can accommodate rapidly changing seasons. These types of mattress pads are typically cool and dry in the summer, but warm and cozy in the winter. It’s also important to add that this type of mattress pad is one of the most expensive mattress pads on the market. Feather mattress pads, also known as featherbeds or down mattress pads, are another option if you are looking to soften an existing mattress that is too firm. These mattress pads are more affordable than a wool mattress pad, but maintain many of the same benefits. Many of these mattress pads are made exclusively with goose or duck feathers. One word of caution- when shopping for feather mattress pads, be sure to select one that has a quilted top. This will help to keep all of the feathers evenly distributed as you sleep and avoid a lumpy mattress pad. Fiber mattress pads, sometimes referred to as fiberbeds or down alternative mattress pads (ex. eLuxurySupply bamboo mattress pad), are another affordable option if you’re looking to soften a firm mattress. These mattress pads are commonly compared to feather mattress pads, but instead of using traditional feathers, they are filled with a polyester fiber or down alternative material. These are typically the most affordable between wool and traditional down mattress pads, but the lifespan may not be as long. In addition, some sleepers find that these types of mattress pads become lumpy and flatten out in a short period of time. Regular “fluffing” will help to prolong this as well as choosing one with a quilted top.